Today, government organizations face several unique challenges when it comes to building the next generation of leaders. With shrinking budgets, an ageing workforce, and recent pay and hiring freezes decreasing morale, federal human resources professionals need to figure out not only how to recruit young, top talent, but how to retain these future leaders for the long-term. According to the Office of Personnel Management (OPM), millennials will make up approximately 75% of the national workforce by 2025. However, only 11% of current government employees are millennials – an issue that indicates the potential for a major talent gap in the industry. 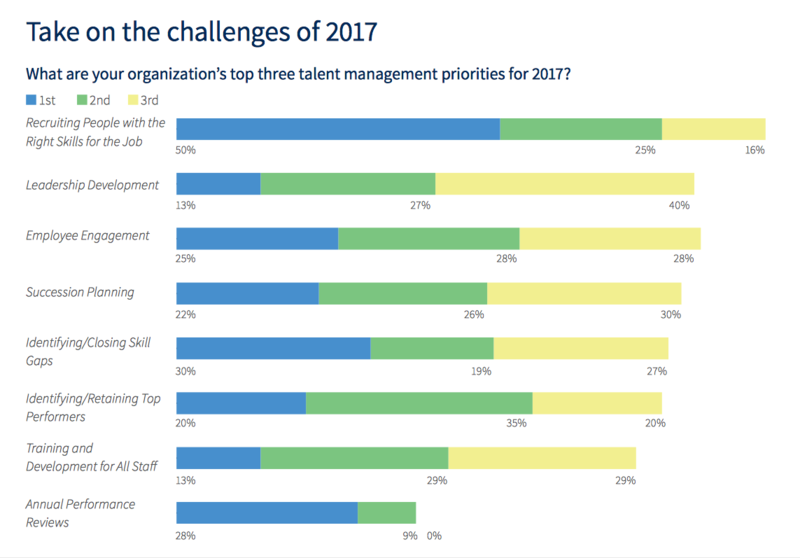 Indeed, research from Cornerstone OnDemand in association with WBR Digital, published in the HCMG 2017 Benchmark Study, found that the number one talent management priority of government employers in 2017 is recruiting people with the right skills for the job, with leadership development, succession planning, and identifying and retaining top performers also of notable concern. But hiring the best and the brightest and retaining them for the long-term is a lot easier said than done for government HR professionals and hiring managers. Competition from the private sector is particularly rife. An excellent employee leaving the public sector because it is felt that their needs aren’t being met in the way that another organization can is a story that many will be familiar with. And there are other workforce challenges facing government agencies, too – a lack of millennial interest due to the perception that there is no room to grow in public service, the current uncertainty surrounding the public sector in general, increased scrutiny and pressure, and of course the ongoing issue of baby boomers reaching retirement age and taking skills and knowledge with them when they leave. Flexibility is indeed important. Technology is not only redefining when employees work, but how they work – today’s employees expect to be empowered to work anytime, anywhere, and on any device, ensuring that work-life balance issues can be self-managed. But in order to facilitate and foster the sort of environment that employees want, agencies must embrace solutions that allow HR professional to effectively manage government employees across the entire hire-to-retire lifecycle. Such solutions, Gill says, should be built around the needs of employees in order to meet talent strategy objectives. He cites cloud-based technologies that help organizations recruit millennials by giving hiring managers access to real-time data about the talent pool as an example. Specifically, unified systems solutions that give HR teams one cloud-based portal to work with are particularly effective. These enable the accessibility of all workforce data at every phase of the employee lifecycle through a single interface, which helps agencies better manage limited resources, and make more data-driven decisions about recruiting, training, performance management, and succession planning. “That gives HR professionals, as well as senior government officials, the ability to make informed decisions about the current workforce and the size and needs of the future government workforce,” Gill said. Importantly, such solutions also facilitate employee engagement, as they enable organizations to develop career tracks so that employees and prospective employees can see a future in the organization, and don’t feel like they are stuck in a dead-end job. If a dedicated, public sector workforce for the future is to be fostered, government organizations need to systematically develop employees, which means HR professionals finding ways to increasingly manage people instead of paperwork – and this is exactly what cloud-based human capital management solutions are designed to enable. The last word goes to Jim Gill. Hear Cornerstone OnDemand’s Steve Dobberowsky, Principal of Thought Leadership and Advisory Services, for his keynote session ‘Help HR Be Courageous! : Unified Talent Management for the Modern Agency’ at HCMG 2017 this December. Download the HCMG 2017 Agenda to learn more.